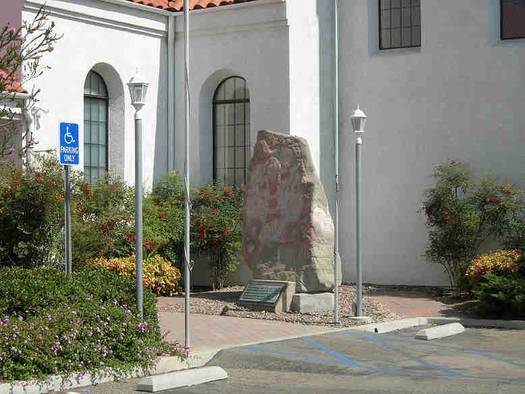 Replica of Harald Bluetooth’s rune stone in front of the Danish church in Yorba Linda. Photo: Lisbeth Imer. The Danish Lutheran Church of Southern California in Yorba Linda resembles a typical, whitewashed village church found in the Danish countryside. A painted replica of King Harald Bluetooth’s rune stone, a reminder in a distant place of the conversion of the Danes in the Viking Age, can be seen in front of the entrance to the church and the Danish cultural centre. Until 1993 the replica stood in front of the EAC company Danola, in the City of Commerce, east of downtown Los Angeles. The replica was commissioned in 1965 as a gift from the company JAKA in Brabrand, near Århus, for a foreign business partner – the East Asiatic Company (Østasiatisk Kompagni) in Los Angeles. The EAC was founded in Copenhagen in 1897, at that time for trade with South East Asia. Over the following decades the trading and sea transport activities of the EAC expanded across the world. In 1965 it acquired the company Plumrose, the foothold of EAC ventures in South America. The basis of the replica is a plaster cast made in 1965 by the plaster company Ferdinandsen in Copenhagen. 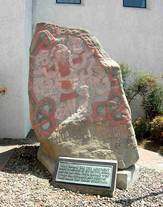 As the first step in the process Harald Bluetooth’s original rune stone was covered in soap. Thin coats of plaster were then applied and strengthened with coco fibres. The shells were strengthened further in the workshop before being assembled into a mould. The replica was then cast from a mixture of cement and broken granite. It is hollow and therefore weighs considerably less than the original.